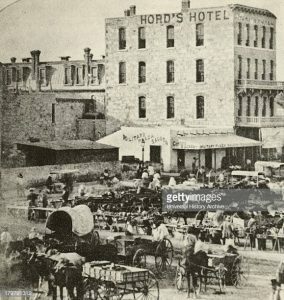 San Antonio n the 1870’s. Just finished a final draft of the novel about Simon the Fiddler and sent it off to agent and editor. Am looking for a title. This is a view from the west side of Military Plaza with the Horde Hotel and the Military Plaza saloon just to the left of it. San Antonio became a transportation center and a truly wild place in the years after the Civil War with freight trains (wagons) coming in from the coast, and the coast (Galveston, Copano, Indianola) was where all the shipments came to by steamship or wind-driven ships. Transportation military, and entertainment for all these people. It was crowded and lively and the old Spanish air of the town was quickly being overwhelmed. I have had a interesting time researching the older fiddle tunes, and find that the names of the old tunes often have nothing to do with what it sounds like. Most people who know country music know “Black Mountain Rag” (in which Doc Watson played 77 notes in 11 seconds one time, on film) and it seems it came from an older tune named “The Lost Child”, and it was just as wild and fast under the latter name as the former. “A Man Of Constant Sorrow” was earlier known as “Down In The Tennessee Valley” and “Red River Valley” came from a melody known as “In The Bright Mohawk Valley”, from Manitoba. Tunes wander and take on other names and other variations, musicians take them and vary them, their variations become popular in the world of musicians — folk musicians — all these changes as untraceable as the water in an aquifer. 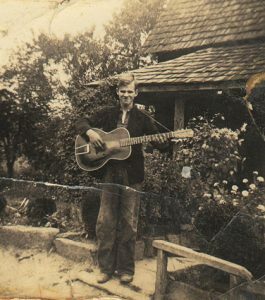 Doc Watson, blind from age one, born in the hills of North Carolina in 1923, his playing was faultless, magical. This entry was posted in News on January 19, 2019 by admin.